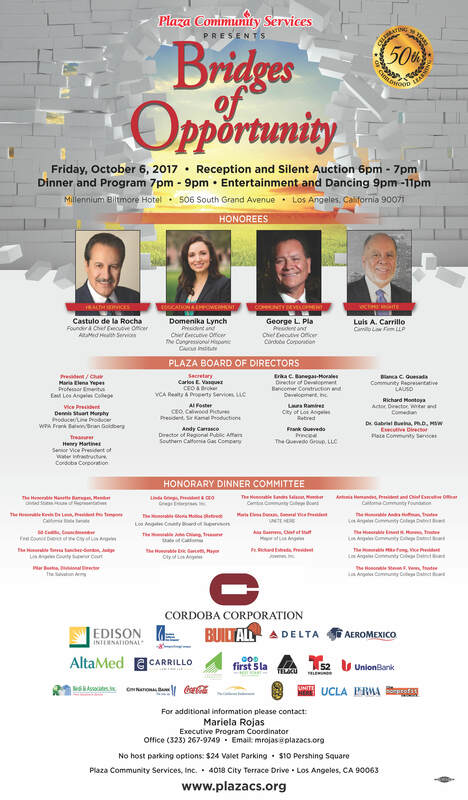 George L. Pla, a successful entrepreneur and philanthropist whose business and civic activities have helped communities across California, will be honored by Plaza Community Services at its “Bridges of Opportunity” Dinner on Friday, October 6, 2017, at the Millennium Biltmore Hotel. Pla will receive the “Community Development” award and will be introduced at the event by former Los Angeles Mayor and State Assembly Speaker Antonio Villaraigosa. Pla is President, CEO and Founder of Cordoba Corporation, a statewide full-service ENR Top 50 Program Management Firm and Top 100 Construction Management-for-Fee Firm specializing in the delivery of infrastructure projects in transportation, education, water and energy sectors. Pla’s professional achievements have been recognized by the Hispanic Business Magazine, where he was named as one of the 100 Most Influential Latinos in the nation. He is a co-founder of the Latino Alumni Association at the University of Southern California (USC) and a co-founder and the current president of the City Club, a business club in Los Angeles that embraces and reflects the diversity of the city. 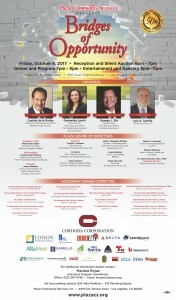 Other civic and community leaders who will be honored at Plaza’s “Bridges of Opportunity” Dinner include Castulo de la Rocha, Founder & CEO of AltaMed Health Services (Health Services Award); Domenika Lynch, President & CEO of the Congressional Hispanic Caucus Institute (Education & Empowerment Award); and Luis A. Carrillo – Carrillo Law Firm LLP (Victims’ Rights Award).